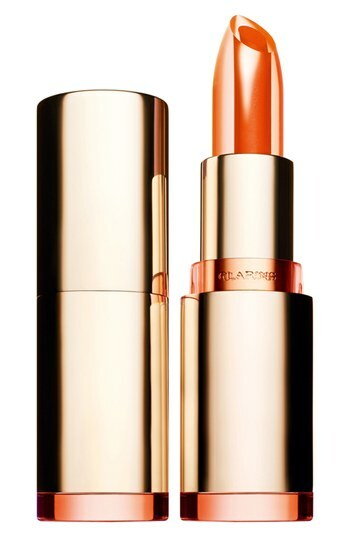 Clarins' lovely lip balms are back this summer with a new limited edition version and they are BEAUTIFUL. The balm is actually a balm/lipstick hybrid which is made of a transparent jelly-texture bullet with an inside core of a sheer lip color. Swiped on the lips together, the effect is that of a tinted balm that has enough color and moisture perfect for everyday looks. I loved the Crystal Mandarin shade (shown, above) which is a sheer, beautiful warm orange. This is a perfect shade for all of you brown girls and girls with a tan. It also has a really yummy scent - a little bit of a warm vanilla and some berries! The balm applied smoothly, but I would recommend that you direct the center of the bullet towards the outer edges of your lips in order to get a uniform color from center to edge. The finish is also really unusual. It starts of very glossy and then becomes a semi-matte. The actual bullet is sturdy and glamorous, so you'll love taking it along with you for the daily touchups after drinking/eating. However, you won't even have to do that over and over, because the wear of the color was more like that of a lipstick. There was definitely a stain left on my lips even when the majority of the color began to wear off. *This product was provided courtesy of Clarins PR for reviewing purposes.